← TRC #449: Why Use Stop In Telegrams? + Ask An Astronomer ft Dr. Stuart Robbins + Do Babies Look Like Dad To Avoid Abandonment? Save Knocked Out Teeth With Milk? This entry was posted in The Reality Check Episodes and tagged avulsed, Barry Panas, car, colour, insurance, physics, teeth, Zelda. Bookmark the permalink. Great show, as usual. Though I’m not quite convinced by the Physics Of Zelda explanation. 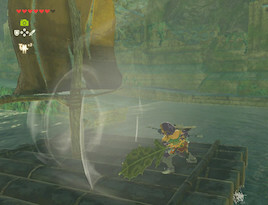 According to Newton’s Third Law of Motion whenever there is an action, there is an equal and opposite reaction, so if Link holds his position within the raft, the force generated by the leaf push both Link and the raft back. If the same force hits the sail, both forces tend to cancel each other. I found the topic so interesting, I wrote a post with a detailed explanation. Please check it out at http://www.ricardocasallas.com/post/zelda-laws-of-motion. Replace the fan with a canon and the wind with a cannonball. The sail is replaced with a very sturdy wall (the cannonball cannot go through it). If the canon shoots a cannonball at the wall, the cannon exerts a forwards force on the ball, and the ball exerts an equal and opposite force on the cannon (which we will treat as being a part of the boat). This would send the boat backwards and the ball forwards. They would have equal and opposite momenta, assuming that the original momentum of everything was zero. When the ball hits the wall (which is also a part of the boat) the ball will push the wall (i.e. sail) forwards, and the wall will push the ball backwards (equal and opposite), but there are a number of possibilities. One possibility is that the wall stops the ball completely (an inelastic collision). In this case, there will be no net momentum gain of the boat … it will again be at rest, as will the ball. This is the “it doesn’t work scenario”. But now consider the ball *bouncing* back from the wall, so that it actually ends up moving backwards. The canon has literally shot the ball forwards, but due to the interaction with the wall, the ball ends up moving backwards. In this case, the “force” between the ball and the wall (or wind and sail) will have been “stronger” (larger impulse to be exact) than the interaction between the canon and the ball. In this case the boat would have had a net force (impulse actually) forwards and the ball would have a net force (impulse) backwards. Note that the ball is no longer a part of the boat – we will let it go flying out the back. Getting closer to the setup of the fan and the sail, consider an electric fan mounted on a boat: the fan blows the air forwards directly into a tube which is also attached to the boat. The tube makes a 180 degree bend such that the air gets released moving backwards. Note that the air has interacted with both the fan (part of the boat) and also the tube (which is another part of the boat). Clearly the net effect is that the “boat has pushed the air backwards” … and the air will indeed have pushed the boat forwards, though this was the end result of what may be considered to be two separate interactions … both of which are in accord with Newton’s 3rd Law. I have to say, the segment in this episode about red car insurance was not as good as the segment on red car insurance adam did in episode 101. Oh wow. Usually we notice when we do a repeat but it looks like none of us remembered having covered this one 349 episodes ago. Thanks noticing Bob! Professional teacher here … that was very much on purpose. Just a test to see if you were paying attention!